God this is a weird movie. 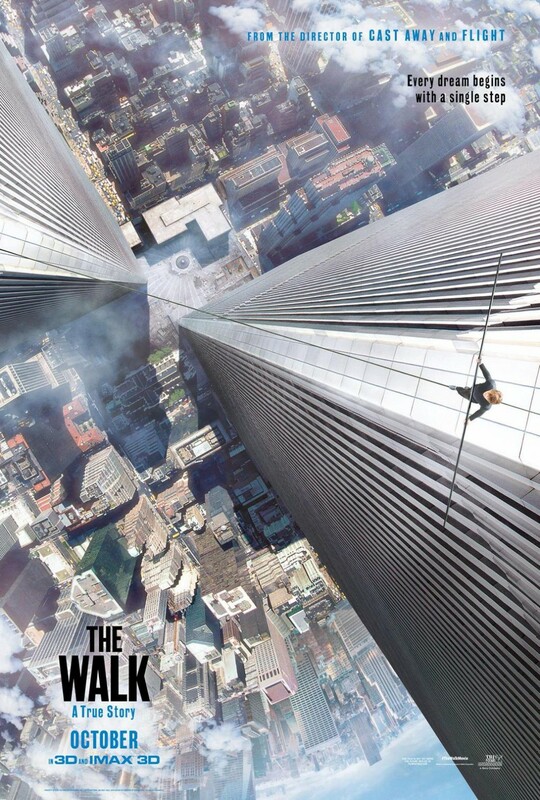 Robert Zemeckis (Back to the Future) is known for his ambitious and expansive movies, and The Walk is no exception. It’s a huge movie in terms of scale and it’s visually electrifying. But the movie itself is just super weird. Towers of the World Trade Center. In a post-9/11 world, this is strange enough what with the long, loving shots of the towers throughout the film. It’s never uncomfortable, in fact they’re breathtaking, but it does momentarily hit you as you watch, the real history of these buildings. As the film takes place in 1974, the tragic events of 2001 are never (directly) referenced, but it is difficult to get that out of your mind at the beginning. But, even stranger is Zemeckis’ decision to frame the entire film as a story being told to us by the main character, Philppe Petit (Joseph Gordon-Levitt), as he stands (randomly) on the top of the Statue of Liberty. Bear in mind the Statue of Liberty has no involvement in this film at all. Gordon-Levitt simply spends time pacing the torch of the statue while relating this story throughout the movie. The story itself is about Petit’s Moulin Rouge-like quest make “art” through walking high wires to further and further acclaim. Petit sees himself as an avant-garde artist of the highest regard who desires to stun the world with his feats of derring-do. Quite what is intrinsically “artistic” about high wire walking is lost on me, but with the help of several friends of the avant-garde art scene and Gordon-Levitt’s own fake (and surprisingly good) French accent, they plan this “coup” to perform this stunt. While this story of obsession bordering on mania isn’t hard to follow, as Petit’s fervor grows it becomes increasingly uncomfortable to watch. Gordon-Levitt does a remarkable job portraying this character who is at once interesting in his single-mindedness and totally alien in his complete detachment from the illogic of his desires. But, ultimately this movie is strange because it locks itself in format completely. You see this movie is visually remarkable but if you’re not seeing it in the best possible conditions (IMAX 3D) then the movie loses nearly all of its appeal. The story and the acting aren’t enough to carry this film, without the visual grandeur, it’s simply a very small movie about an obsession told by a quirky madman. But in large format with the extra depth 3D offers the movie acquires a spectacular new aspect and the visuals cross over from mundane to dizzyingly rich. The camera swoops and spins and dives and soars throughout the film allowing the viewer a glimpse what Petit is experiencing as he walks through empty space. Seeing this film in any other way – even should you be intensely acrophobic as I am – is to lose an integral part of the film and is tantamount to experiencing a sunset by watching nothing but the shadows it casts on the ground. Like, you’d still see it, but would you? Releasing this movie on DVD (even 3D Blu-Ray) is a waste of money because no one has the screen format to do it justice.